We dropped everything and rushed outside to see the meadow sky filled with thousands of honey bees. Swarming happens when the colony becomes too big for the hive and is a means of reproducing. The old queen lays new queen broods and then under the cohersion of the lady workers, is starved to make her light enough to fly and then is not so subtley booted out to make room for the new virgin queen to hatch and take over the old hive. The old queen, in something reminiscent of a Game of Thrones episode, is forced out and approximately half of the workers go with her and scout for a new place to set up a new colony. It is this ‘booting out’ that is effectively the swarm we were witnessing. Three years ago I undertook some training in natural beekeeping at Nectans Meadow, with Sue and Micks apiary, under the tutelage of the barefoot beekeeper Phil Chandler. 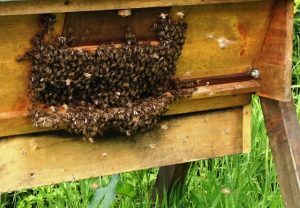 During that teaching weekend, we were so very lucky to witness the ‘bearding’ of honey bees under the hive. Bearding is when you see a large clump of bees, in this case around the hive entrance, and is often a means of the bees cooling down. The conditions that lead to ‘bearding’ are high temperatures, over-crowding, lack of ventilation, high humidity or some combination of those factors and during the spring months they may also do this just before they swarm. This spring, Sue and Mick had seen the bees from one of their hives, the ‘posties’, bearding for several days before we arrived for our meeting. 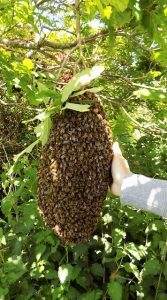 They had a strong inclination that the bees would be swarming soon, but it is something that happens only once or twice a year. For the colony to choose the day that we had our meeting, that we had prearranged months earlier, was insanely lucky and it couldn’t have been planned any better. They even waited for us to finish our tea and cake first. We’re currently building our own top bar hives in anticipation for a homeless swarm. Keep in touch as we’ll be offering natural bee keeping and top bar hive making courses in 2017.